Worplesdon Rangers Football Club » Sir Geoff Signs for Worplesdon Rangers U8s! Sir Geoff Signs for Worplesdon Rangers U8s! 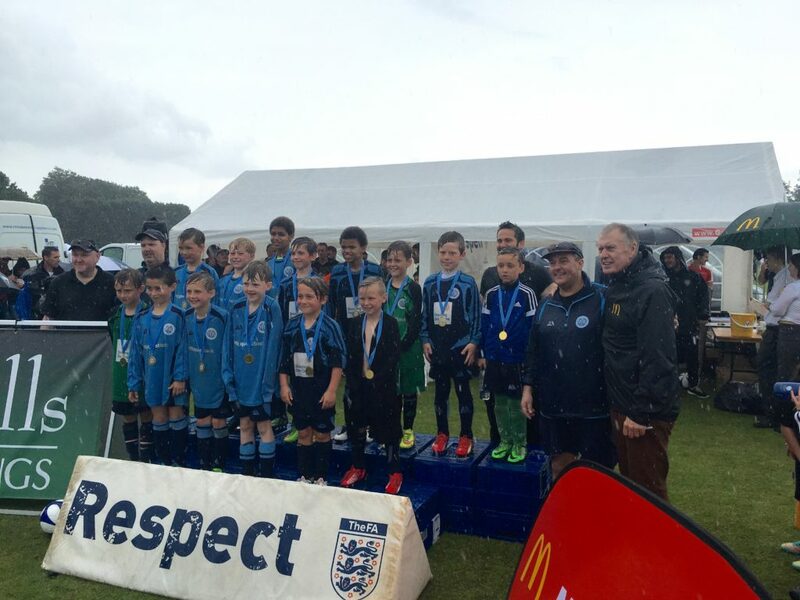 The U8s were out in force on Saturday 11th June for their third and final tournament of the summer and it finished with a brilliant surprise. Both the Pumas and Panthers were at Goldsworth Park Rangers for their U8 Junior Tournament. This was the first outing for the boys in a 7v7 format (up from their normal 5v5) but was a good chance to test the water ahead of next season which will all be 7v7. It was a mixed bag of a morning. Some close losses, tough draws, and good wins. And a mix bag of weather too going from hot, sticky and humid to torrential rain at the end! The best part was saved for the medal ceremony at the close when the boys all went up to receive their medals and had their photo taken with Sir Geoff Hurst! The England legend was on great form, posing for photos, signing balls and autographs and the boys were super excited to meet the man who scored a hat-trick in the ’66 World Cup Final.